I just ran across Twist and Shout: Images and Graphs in Skeptical Climate Media, a compendium of cherry picking and other chartjunk abuses. I think it misses a large class of (often willful) errors: ignoring the climate bathtub. Such charts typically plot CO2 emissions or concentration against temperature, with the implication that any lack of correlation indicates a problem with the science. But this engages in a combination of a pattern matching fallacy and fallacy of the single cause. Sometimes these things make it into the literature, but most live on swampy skeptic sites. Notice how we’re supposed to make a visual correlation between emissions and temperature (even though two integrations separate them, and multiple forcings and noise influence temperature). Also notice how the nonzero minimum axis crossing for CO2 exaggerates the effect. That’s in addition to the usual tricks of inserting an artificial trend break at the 1998 El Nino and truncating the rest of history. Silver Lining to the White House Climate Panel? The White House is reportedly convening a panel to reexamine the scientific consensus on climate. How does that work, exactly? Are they going to publish thousands of new papers to shift the apparent balance of opinion in the scientific literature? And hasn’t analysis of consensus already been done to death, with a null result for the skeptics? The problem is that there isn’t much for skeptics to work with. There aren’t any models that make useful predictions with very low climate sensitivity. In fact, skeptical predictions haven’t really panned out at all. Lindzen’s Adaptive Iris is still alive – sort of – but doesn’t result in a strong negative feedback. The BEST reanalysis didn’t refute previous temperature data. The surfacestations.org effort used crowdsourcing to reveal some serious weather station siting problems, which ultimately amounted to nothing. And those are really the skeptics’ Greatest Hits. After that, it’s a rapid fall from errors to nuts. No, satellites temperatures don’t show a negative trend. Yes, Fourier and wavelet analyses are typically silly, but fortunately tend to refute themselves quickly. This list could grow long quickly, though skeptics are usually pretty reluctant to make testable models or predictions. That’s why even prominent outlets for climate skepticism have to resort to simple obfuscation. So, if there’s a silver lining to the proposed panel, it’s that they’d have to put the alleged skeptics’ best foot forward, by collecting and identifying the best models, data and predictions. Then it would be readily apparent what a puny body of evidence that yielded. Author TomPosted on February 26, 2019 Categories SkepticsLeave a comment on Silver Lining to the White House Climate Panel? 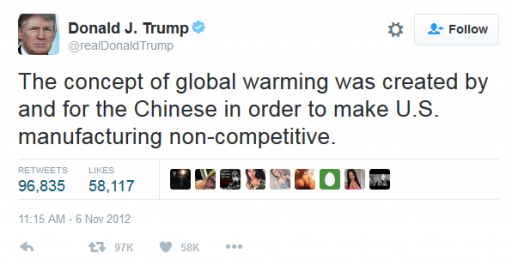 Trump gets well-deserved criticism for denying having claimed that the Chinese invented climate change to make US manufacturing non-competitive. The idea is absurd on its face. Climate change was proposed long before (or long after) China figured on the global economic landscape. There was only one lead author from China out of the 34 in the first IPCC Scientific Assessment. 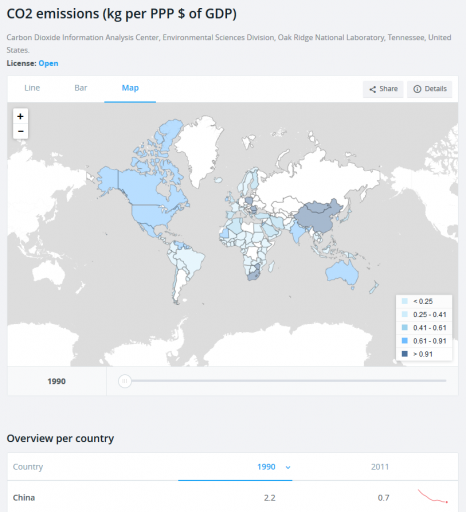 The entire climate literature is heavily dominated by the US and Europe. Today, China’s carbon intensity remains more than twice that of the US. That makes a carbon tax with a border adjustment an attractive policy for US competitiveness. What conspiracy theory makes it rational for China to promote that? How many things can you get wrong on one chart? Truncate records that start ca. 1850 at an arbitrary starting point. Calculate trends around a breakpoint cherry-picked to most favor your argument. Report misleading linear trends by simply dropping the quadratic term. Fail to notice the obvious: that temperature in the second period is, on average, higher than in the first. Choose a loaded color scheme that emphasizes #5. Fail to understand that temperature integrates CO2. Fallacy of the single cause (only CO2 affects temperature – in good company with Burt Rutan). Author TomPosted on June 23, 2014 Categories SkepticsLeave a comment on How many things can you get wrong on one chart? Regarding Professor Nordhaus’s fifth point that there is no evidence that money is at issue, we simply note that funding for climate science has expanded by a factor of 15 since the early 1990s, and that most of this funding would disappear with the absence of alarm. Climate alarmism has expanded into a hundred-billion-dollar industry far broader than just research. Economists are usually sensitive to the incentive structure, so it is curious that the overwhelming incentives to promote climate alarm are not a consideration to Professor Nordhaus. There are no remotely comparable incentives to the contrary position provided by the industries that he claims would be harmed by the policies he advocates. Notice that it’s completely impractical to make the scale large enough to see any detail in climate science funding or NGOs. I didn’t even bother to include the climate-specific NGOs, like 350.org and USCAN, because they are too tiny to show up (under $10m/yr). Yet, if anything, my tally of the climate-related activity is inflated. For example, a big slice of US Global Change Research is remote sensing (56% of the budget is NASA), which is not strictly climate-related. The cleantech sector is highly fragmented and diverse, and driven by many incentives other than climate. Over 2/3 of the NGO revenue stream consists of Ducks Unlimited and the Nature Conservancy, which are not primarily climate advocates. This is a ludicrous comparison. To get some facts on the ground, I will compare two specific cases: that of my university and that of Dr. Cohen’s former employer, ExxonMobil. Federal climate-related research grants to Yale University, for which I work, averaged $1.4 million per year over the last decade. This represents 0.5 percent of last year’s total revenues. By contrast, the sales of ExxonMobil, for which Dr. Cohen worked as manager of strategic planning and programs, were $467 billion last year. ExxonMobil produces and sells primarily fossil fuels, which lead to large quantities of CO2 emissions. A substantial charge for emitting CO2 would raise the prices and reduce the sales of its oil, gas, and coal products. ExxonMobil has, according to several reports, pursued its economic self-interest by working to undermine mainstream climate science. A report of the Union of Concerned Scientists stated that ExxonMobil “has funneled about $16 million between 1998 and 2005 to a network of ideological and advocacy organizations that manufacture uncertainty” on global warming. So ExxonMobil has spent more covertly undermining climate-change science than all of Yale University’s federal climate-related grants in this area. Money isn’t the whole story. Science is self-correcting, at least if you believe in empiricism and some kind of shared underlying physical reality. If funding pressures could somehow overcome the gigantic asymmetry of resources to favor alarmism, the opportunity for a researcher to have a Galileo moment would grow as the mainstream accumulated unsolved puzzles. Sooner or later, better theories would become irresistible. But that has not been the history of climate science; alternative hypotheses have been more risible than irresistible. Given the scale of the numbers, each of the big 3 oil companies could run a climate science program as big as the US government’s, for 1% of revenues. Surely the NPV of their potential costs, if faced with a real climate policy, would justify that. But they don’t. Why? Perhaps they know that they wouldn’t get a different answer, or that it’s far cheaper to hire shills to make stuff up than to do real science? Minds are like parachutes, or are they dumpsters? Open Minds has yet another post in a long series demolishing bizarre views of climate skeptics, particularly those from WattsUpWithThat. Several of the targets are nice violations of conservation laws and bathtub dynamics. For example, how can you believe that the ocean is the source of rising atmospheric CO2, when atmospheric CO2 increases by less than human emissions and ocean CO2 is also rising? The prevailing paradigm simply does not make sense from a stochastic systems point of view – it is essentially self-refuting. A very low bandwidth system, such as it demands, would not be able to have maintained CO2 levels in a tight band during the pre-industrial era and then suddenly started accumulating our inputs. It would have been driven by random events into a random walk with dispersion increasing as the square root of time. I have been aware of this disconnect for some time. When I found the glaringly evident temperature to CO2 derivative relationship, I knew I had found proof. It just does not make any sense otherwise. 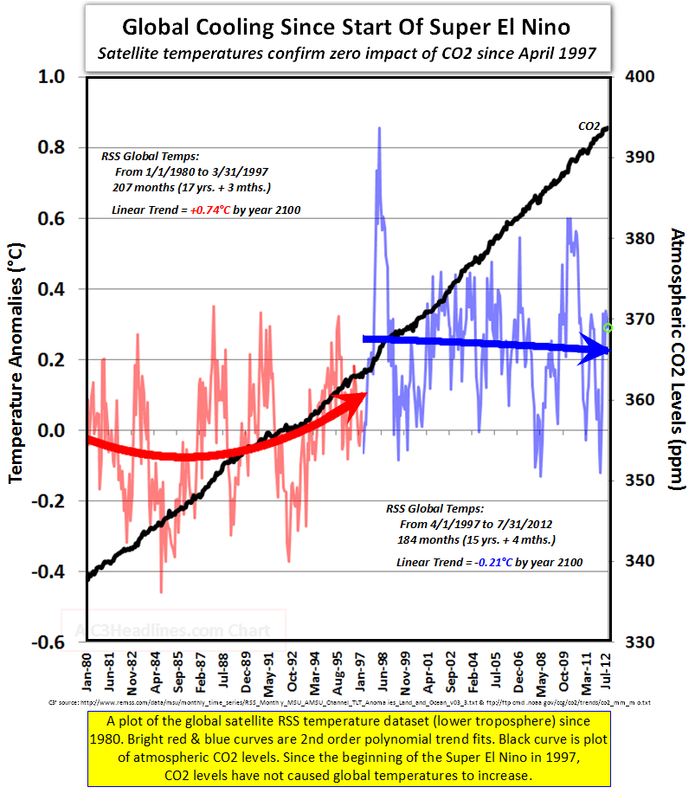 Temperature drives atmospheric CO2, and human inputs are negligible. Case closed. I suspect that a lot of people would have trouble distinguishing this foolishness from sense. In fact, it’s tough to precisely articulate what’s wrong with this statement, because it falls so far short of a runnable model specification. I also suspect that I would have trouble distinguishing similar foolishness from sense in some other field, say biochemistry, if I were unfamiliar with the content and jargon. This reinforces my conviction that words are inadequate for discussing complex, quantitative problems. Verbal descriptions of dynamic mental models hide all kinds of inconsistencies and are generally impossible to reliably test and refute. If you don’t have a formal model, you’ve brought a knife, or maybe a banana, to a gunfight. There are two remedies for this. We need more formal mathematical model literacy, and more humility about mental models and verbal arguments. Author TomPosted on June 7, 2012 Categories Aside, SkepticsLeave a comment on Minds are like parachutes, or are they dumpsters? A natural driver of increasing CO2 concentration? You wouldn’t normally look at a sink with the tap running and conclude that the water level must be rising because the drain is backing up. Nevertheless, a physically similar idea has been popular in climate skeptic circles lately. You actually don’t need much more than a mass balance to conclude that anthropogenic emissions are the cause of rising atmospheric CO2, but with a model and some data you can really pound a lot of nails into the coffin of the idea that temperature is somehow responsible. This is another experimental video. As before, there’s a lot of fine detail, so you may want to head over to Vimeo to view in full screen HD. I find it somewhat astonishing that it takes 45 minutes to explore a first-order model. 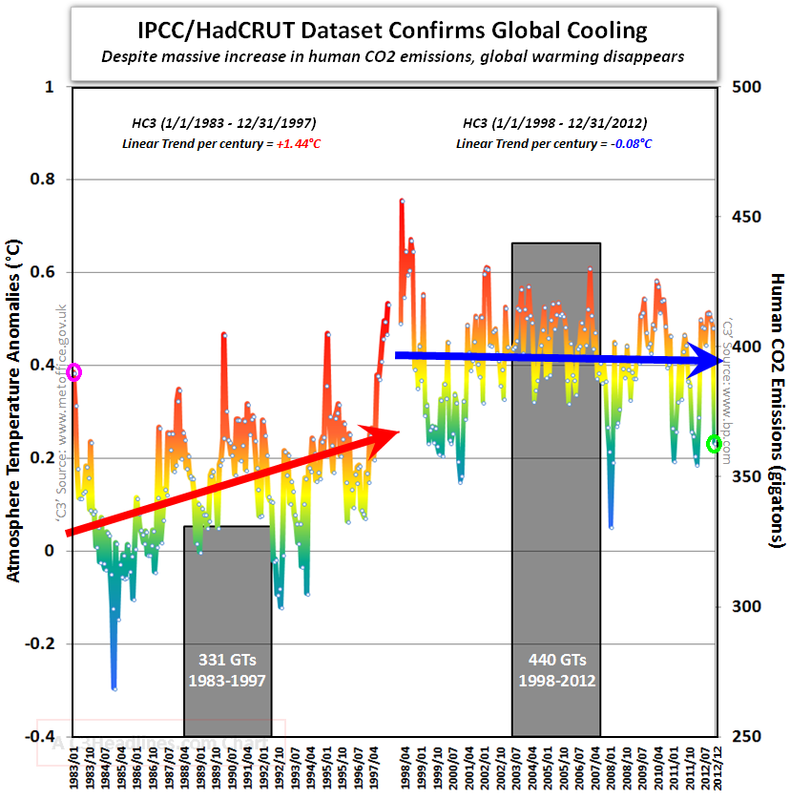 Author TomPosted on September 3, 2011 Categories Skeptics, SystemDynamicsTags CO2, SalbyLeave a comment on A natural driver of increasing CO2 concentration?